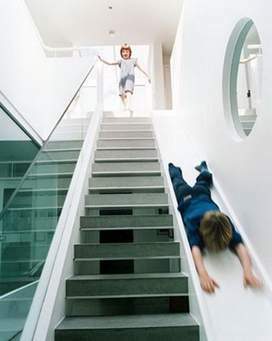 A stair should be well ventilated. It should have good approaches from all corners of the building. Every flight should be separated from the other by spacious and well ventilated landings. As far as possible winders should be avoided. If at all, they are to be provided, they should be provided at the bottom and not at the top. The width of the landing should not be less than the width of the stairs. The width of the stairs in residential buildings should no be less than 75 cm and for public buildings it should not be less 1han T25 m.
Rise + Going =40 to 45 cm. Rise × Going =426 cm. There should be an adequate head room, having a mini­mum height of 2.2 metres. The hand railing should be of a suitable size and shape that it can easily be gripped in hand. The height of the hand. The height of the hand railing hould not be less than 75 cm nor more than 10 cm From the line of nosing.